PennsylvAsia: Pittsburgh Ginkgo Fest, November 4. 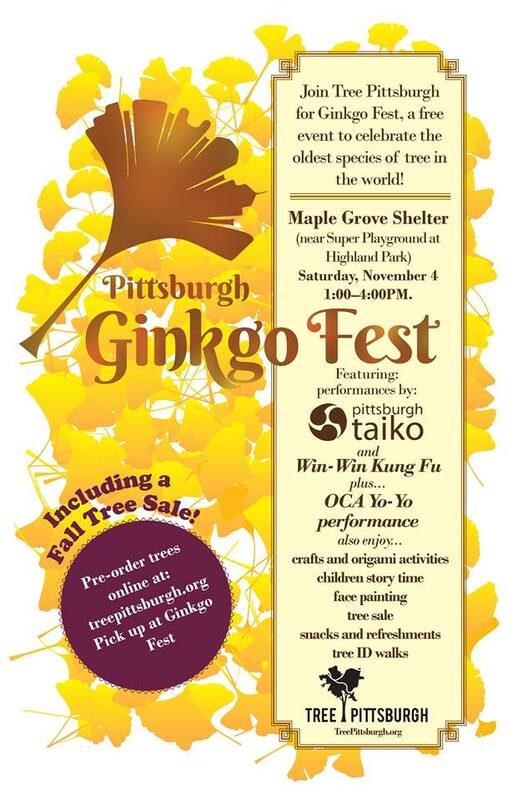 Tree Pittsburgh will present its annual Ginkgo Fest on November 4 in Highland Park. The festival will feature crafts and origami activities, children story time, tree ID walks, and photos in front of Pittsburgh's largest ginkgo tree. Enjoy performances from Pittsburgh Taiko, a yo-yo performance by Organization of Chinese Americans, and Win-Win Kung Fu Culture Center! We'll also have friends GASP, Pittsburgh Parks Conservancy, American Homestay Services, llc, Dormont Public Library, and Green Mountain Energy Companyat the event as well. Ginkgo trees are renowned for their medicinal properties, their outstanding urban tolerance, and their beautiful fall color. The ginkgo tree species dates back to over 150 million years. Come celebrate this timeless tree with us at the Maple Grove Shelter (near Super Playground at Highland Park). It runs from 1:00 to 4:00 pm at the Maple Grove Shelter (map), and is free and open to the public.